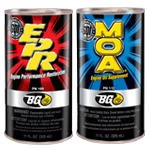 Better gas mileage with BG EPR® and BG MOA® | BG Products, Inc. I have a 2010 Mercury Milan with 205,000 miles. I recently purchased this vehicle as a daily driver to go back and forth from work. The EPA combined rating says it should get about 26 MPG. I commute about 20 miles per day, driving eight of those miles on the highway and the rest on local/back roads. I was getting about 24 MPG per the mileage calculator on the car. My local distributor suggested a BG Fuel/Air Induction Service with a fuel rail cleaning, a can of BG 44K® and an oil change with BG EPR® and BG MOA®. The service was performed as instructed and my spark plugs were replaced. I filled the gas tank before I left work on the same commute and I am now getting 29.5 MPG. I don’t know what to say but WOW and thank you.